On Tuesday, 22 January, activists and supporters of Coup Pour Coup 31, anti-imperialist collective and a member organization of the Samidoun Palestinian Prisoner Solidarity Network, held an information stand at Capitole metro station in Toulouse, France. 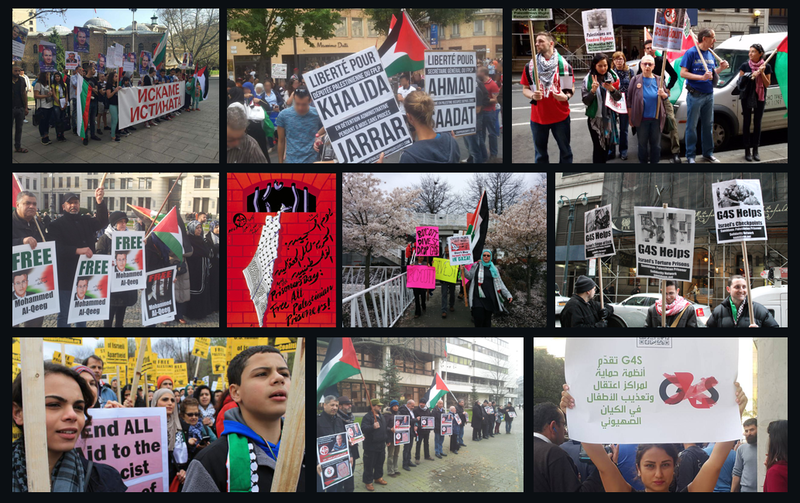 The action, which continued for over two hours, came as part of the International Week of Action to Free Ahmad Sa’adat and all Palestinian prisoners. Dozens of events have been organized in international cities highlighting the imprisonment of Palestinian national leader and Popular Front for the Liberation of Palestine General Secretary Ahmad Sa’adat. The action included the distribution of over 600 leaflets urging Sa’adat’s freedom, signing up 15 new subscribers for Coup Pour Coup’s newsletter, gathering donations and playing Palestinian music while discussing the latest events in Palestine with passersby – including the attacks on recent days inside Ofer prison. They also distributed leaflets calling for the boycott of Israel and expanding the boycott,divestment and sanctions campaign as well as material on the case of Georges Ibrahim Abdallah, the Lebanese Arab struggler for Palestine imprisoned in France for over 34 years, and Khalida Jarrar, the imprisoned Palestinian parliamentarian, leftist and feminist jailed without charge or trial under administrative detention.